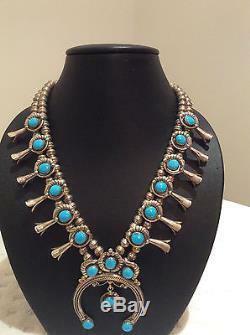 Antique Navajo Indian Squash Blossom Necklace Turquoise Sterling Silver. Total Weight: 110.6 Grams. Total Size Of The Crescent Is: 7cm Width is 5cm. Total Length Of Necklace Is 30cm. Stamped STERLING As Seen In The Pictures. A Bit Of History Of This Necklace's Origins. For thousands of years, symbols have told stories and have also served as a method to gain power over the forces and the phenomena which effect a society or a person. The inverted crescent pendant on squash-blossom necklaces, called the'Naja' by the Navajo, is found in various design forms throughout the world cultures. As a crescent, this form goes back as far as the Paleolithic period. 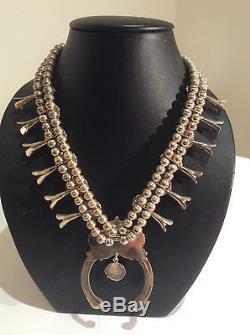 It is mentioned in the book of Judges as an ornament worn around the necks of camels. In the Phoenician culture, Astarte was the goddess of fertility and she was represented by the inverted crescent as well. As pendants, the inverted crescent has also been found in ancient Roman, and Crete artifacts. During the Middle Ages, the Moors rode out of the East and conquered lands in a westerly direction including eight centuries of occupation in Spain. They adopted the symbol as a bridle ornament, and thought the inverted crescent would protect both themselves and their horses from'the evil eye'. When theiards came to South and Central America, they brought that same idea with them for the protection of their horses and of their soldiers. Thus, the Moors taught theish, who taught the Mexicans, who taught the Navajo their belief systems and metallurgy. Coming from another direction in North America, the inverted crescent symbol was on various types of trade goods brought from the East coast by other Europeans. The crescent pendant was used from the early 1800's on, by the Shawnee, Delaware, Cheyenne, Comanche and Navajo tribes, among others. 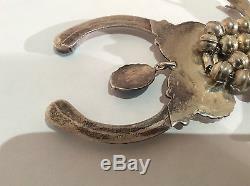 However, metal work of various European influences was found in the southwest as early as the 1700's. At this time, the Navajo were fierce warriors who more often raided but occasionally traded with their neighbors, the Plains Tribes. By the 1820's, Southern Plains metalworkers had learned the processes of cutting, stamping and cold hammering. Much of this work was produced in German silver. German silver was a different alloy as compared with the Mexican silver, which was often used by the Navajo. Through contact with either theish and/or the various Plains Tribes, the Navajo adopted the symbol of the inverted crescent for their horses. The Naja was put on the horse headstall, the front center band of the horse bridle, and later, the Naja moved into the realm of necklaces. In a 1930's interview, "At one time, every Navajo who could afford a silver headstall had one on his horse, " according to Grey Moustache, (a Navajo silversmith who worked the art from the late 1800's into the 1900's). In early 1900 photographs of Hopi dancers, the Naja can be seen as central component of beaded necklaces. The ability to work in silver, leather and other metals, allowed the Navajo to move their culture from a warrior society to more of a merchant society. Where prestige and wealth had come from raiding, it now came from herding, and various art forms. Silverworking was a very important part of this change. According to the Navajo, the symbol of the Naja is decorative, and serves no purpose either as a spiritual symbol or as a specific symbol. Yet, the Naja is held in very high esteem by the Navajo as well as other peoples. One symbol of the squash blossom can be found on ancient petroglyphs at the Saguaro National Monument in Arizona. It is believed that the flower symbol that we commonly see in necklaces was brought to the Navajo at the turn of the century, the 1800's to the 1900's. The blossom is represented with long petals beginning to open and a sphere attached at the base of the flower. The flower pendent is a representation of theish-Mexican pomegranate and a variation of this design can be found in the motif of Granada, Spain. In the Americas,ish colonial gentlemen wore variations of these pomegranate flower blossoms on their shirts, capes and trousers as silver adornments. Some squash blossom necklaces that date from the 1880's and 1890's were made with hand-hammered Mexican silver coins, with the Naja in the same design as the Moor horse bridle pendants. Do Not Miss Out On this Rare Opportunity To Own A Piece Of History. Thank You For Your Understanding. 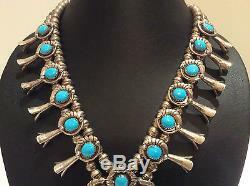 The item "Antique Navajo Indian Squash Blossom Necklace Turquoise Sterling Silver" is in sale since Monday, April 04, 2016. 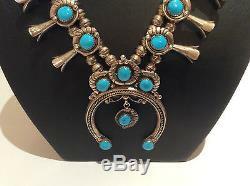 This item is in the category "Jewellery & Watches\Ethnic, Regional & Tribal\Native American\Necklaces & Pendants". The seller is "simonscad" and is located in Thornhill, ON. This item can be shipped worldwide.